Anybody have a unicorn E83? I'm looking for a exceedingly hard to find, LCI E83: 6 speed manual and M pkg... As if manual x3s weren't hard enough to find, I go an get my heart set on having the M pkg as well.... I've seen the manual M sport pre-LCI but never the 07+ 6 spd/Mpkg.. If you have one, and feel like a little humble bragging, let's hear about it! Did you buy new and order it to your preference? Did you search high and low, ship it thousands of miles, or stumble on it locally? Last edited by campy82; 01-31-2015 at 12:10 PM. You do Know the "M" package is not a real M but the Sport package with only cosmetic things. Nothing faster, no better suspension, Just appearance changes only. Yeah- some perf tweaks would have been appropriate, but the difference of the front/rear valances along with the painted side sills is substantial to me... Plus the sport steering wheel looks and feels much better in my opinion. I know that all the pieces could be added to a non M pkg x3- but wouldn't be the same.. I'm set with the LCI- I like the power bump of the newer motor and the freshened tails and headlamps are must haves. The wheel in your post is I believe the sport wheel from the 4.8, correct? 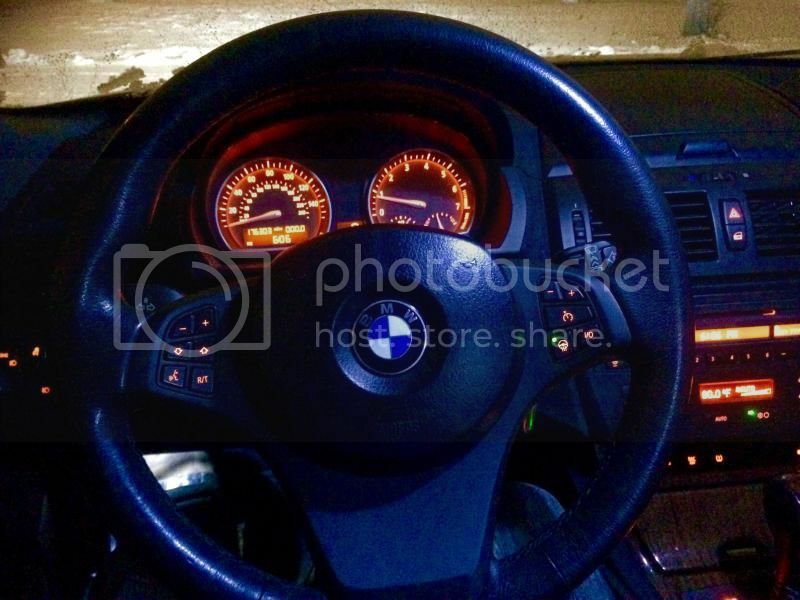 the x3 M sport wheel is slightly different. Funny I should come across this... the wife and I just bought an 06 automatic X3 w/ Mtech over the weekend in Houston that we had our eyes on w/ 90,000 miles. Well today in San Antonio we see a white Mtech for sale in a small dealership lot so we stop in. It's an 07 X3 Alpine White with a 6spd manual trans. Black interior... and looked like it would clean up decently. I didn't check any of the mechanicals or anything as I also prefer the M54 engine which is why we were specifically looking for a 2006. So if anyone is looking there is one here. It needs some love... and I didn't ask what they were wanting for it because ours was in far superior condition (enthusiast loved 2 owner car). PM if you want the details. Award for being the 1st to prove that they exist goes to Crystalworks! awaiting word from the dealer re: asking price and VIN.. Updates to follow. It's been a few days since I first emailed the dealer for price and vin- no reply. A few un-answered calls later, I finally get somebody on the phone who tells me that only the finance manager knows the price would I like to stop in for a test drive... Not meant to be I guess but at least I know that they're out there... The search continues.